An electric grater is a handy tool to have around in any busy kitchen. 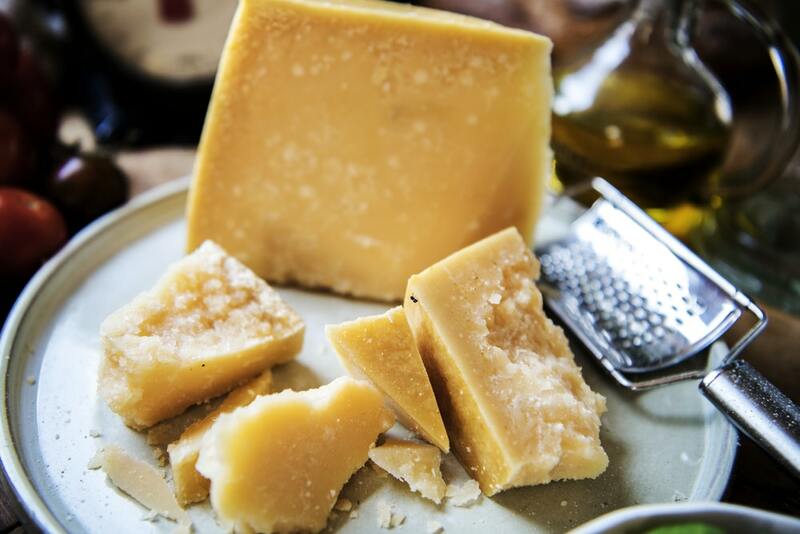 A traditional manual grater takes too much time to use and requires quite a bit of effort. With an electric grater, you can grate or shred a lot of vegetables in just a couple of minutes. Electric graters can be used with just about any vegetable that can be shredded including carrots, potatoes and cucumbers. You can also shred a block of cheese. Some graters are so versatile that they are really complete food processors that can shred, chop, slice and mix. We’ve reviewed the best electric graters below. Our top picks were based on factors like versatility, ease of use and performance in the kitchen. Before we get to the reviews, here’s a complete list of all the factors you should consider when shopping for an electric grater. Electric graters range in size from small handheld units that you can hold over a pan or plate to full food processors that sit on your kitchen countertop and can prep just about anything. The best size depends on your needs. If you do a lot of shredding and grating, get a large unit that can shred a lot of vegetables quickly. If on the other hand you just need something to occasionally grate some carrots or cucumber, a small unit will do. Also consider how much space you have on your countertop when selecting the ideal size. If your worktop is already full of other appliances, consider getting a compact or handheld unit that can be stored out of the way in a cupboard or drawer when not in use. A corded electric grater is the best choice if you plan to shred a lot of stuff. You need a workhorse that won’t keep running out of batteries. But if you need something portable that you can carry to the dinner table or hold over a pan, a battery-powered grater is the best option. It’s also great for camping and picnics. Check how versatile the electric grater is in terms of the types of food it can handle and the number of functions it provides. Corded countertop graters can usually handle all kinds of vegetables as well as other types of food such as cheese and nuts. They also provide multiple functions such as shredding, chopping, grinding and slicing. This saves you the cost of buying extra appliances to handle different types of foods. Stable anti-slip base that doesn’t move about or shake during use. Multiple cones that provide different functions like shredding, chopping and slicing. Large feeding tube that’s easy to push vegetables through. Pushing device. It’s much safer and more efficient than using your fingers. Wide spout that directs food into a bowl without causing any messes. Easy to clean and maintain. Should be easy to disassemble and put back together. 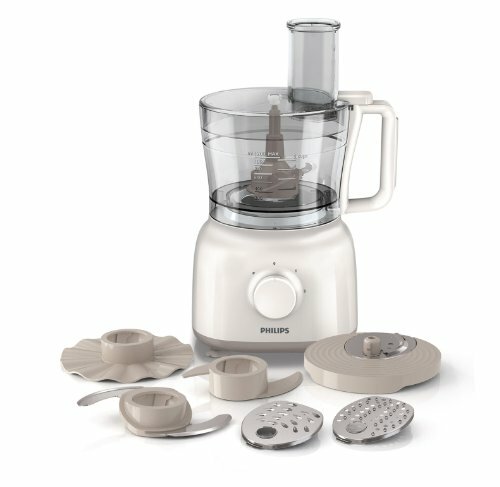 If you are looking for a versatile food processor to meet all your chopping, shredding, blending and even dough-mixing needs, this is it. The grater is just one of the many switchable attachments the food processor comes with. You can use it for shredding carrots, cucumber cheese and other foods. The other attachments are for kneading dough, beating eggs, making whipped cream and blending soups and smoothies. Switching out the attachments is super easy. Once you have the right tool in place, it’s easy to feed whatever you are prepping through the extra-wide feeding tube. There are two speed options to choose from depending on the type of food you are preparing. The lower speed is ideal for kneading dough, beating eggs and preparing whipped cream. The higher speed is perfect for grating, chopping and slicing. The 2.1L jar holds a lot of food and is easy to remove when you are done. If you were blending a smoothie or soup, a hidden inner shaft allows you to pour it into another container without making a mess. 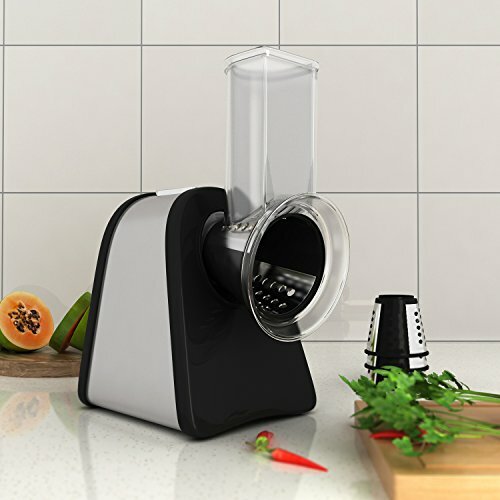 The unit is fairly compact and smaller than standard full size food processors, making it perfect for smaller families and kitchens with limited space. Easy to clean – all accessories and the jar are dishwasher-safe. Small footprint that takes up little space on your counter – perfect for space-limited kitchens. If you just need an electric grater, this is the best option. It is a small handheld and rechargeable electric grater that’s perfect for prepping cheese, nutmeg, nuts, chocolate and anything else you need to shred. The compact handheld design means you can easily hold it over the pan or even plate. Since it is cordless, it’s very easy to hold it any way you want without a cord getting into the way. It’s also handy for use outdoors when camping or on a picnic. The rechargeable battery grates about 1kg of cheese before it needs a recharge. A UK style plug is included for recharging. 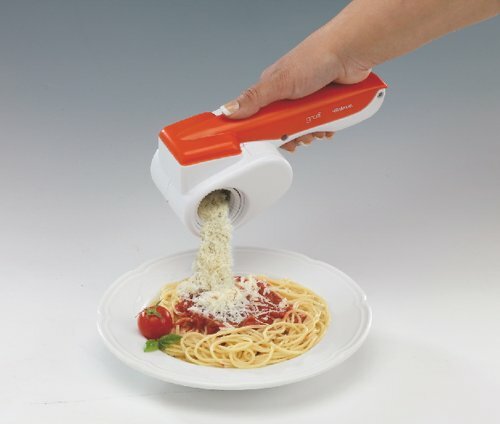 The main downside with this grater is that it comes with just one drum which finely shreds food. It doesn’t have an interchangeable drum with a different level of coarseness. It’s not as versatile as most of the products in this list. Easy to use – it’s compact, light and cordless. Shreds a wide range of foods including chocolate, nutmeg, bread and cheese. If you are looking for a versatile grater without going into full food processor territory, this is a good option. The MeyKey electric salad maker comes with 4 interchangeable cone blades with varying grating fineness. There’s a fine grating cone, a coarse grating cone, a slicing cone and a potato masher cone. So depending on what you are prepping, you just insert the right cone/drum. It’s easy and quick to change from one cone to another. Some of the foods you can grate include chocolate, bread, carrots, cucumber and nuts. The 200W motor is powerful enough to handle both soft and hard foods. The feeding tube is wide enough to prevent messes when you are adding food to the grater. The serving spout is even wider. Just place a plate or bowl under it to collect the shredded food without making a mess on the counter. The unit takes up little space on your work top and can be disassembled and stored away when not in use. All the attachments are easy to remove and are dishwasher safe. Versatile grating and shredding options. Easy to use and no messes. Another great option if you are looking for a versatile grater that can handle different kinds of food. 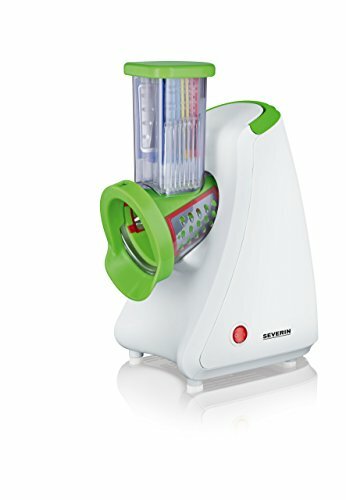 The design is very similar to the Meykey salad maker with a few differences. This one comes with 5 interchangeable stainless steel blades. The blades are colour-coded to make them easy to identify at a glance. – Yellow shredder ideal for nuts, cheese and almonds. 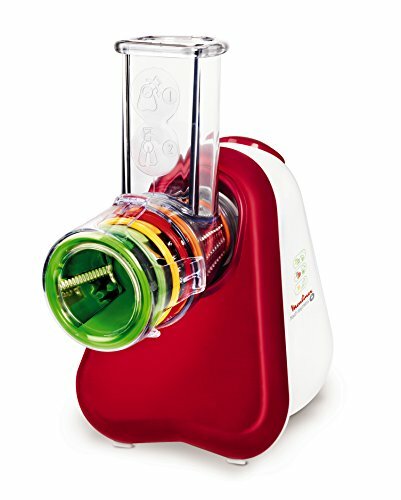 – Red course grater ideal for veggies such as cucumber, zucchini and carrots. – Pink fine grater for chocolate and some types of cheese. – Light blue thin slicer ideal for onions and radish. – Blue thick slicer ideal for cucumber and potatoes. Removing and inserting a new blade takes just a few seconds. The motor is strong and can handle even hard foods without feeling like it will fall apart. The anti-skid feet keep it in place even on a smooth worktop. The feeding tube is large to ensure you don’t make any messes especially with foods like nuts. The spout is also wide and angles downwards to direct shredded food onto a plate or bowl. Once you are done prepping, all attachments come apart easily and can be cleaned in a dishwasher. Takes up little space on the counter and can also be disassembled and stored in cupboard. This one also comes with five interchangeable blades or rollers. This allows you to shred different types of foods including cheese, nuts, carrots, bread and potatoes. It takes just a couple of seconds to change from one roller to another. The feeding tube is wide, ensuring you don’t spill any food when grating. The spout is also wide and serves shredded food directly into a plate or bowl without making messes. The feeding tube and spout can be completely removed from the unit for easy cleaning. They are dishwasher-safe. Stable anti-slip base for easy food prepping. Can grate a wide variety of foods – just select your preferred roller.